In next Sunday’s London marathon, the elite runners will battle it out for the men’s and women’s titles but another competition of sorts will already have taken place on charity runners’ fundraising pages. Each year, millions of pounds are raised in sponsorship donations, most through online fundraising pages which make it easier for fundraisers to raise money – and for charities to claim Gift Aid. But the fundraising pages also create a public platform for giving, with implications for how donors behave. It will surprise few to learn that donors look to amounts given by other people in deciding how much to give. A large donation (£100+), particularly one made early on, can have a sizeable effect, increasing subsequent amounts given by an average of £10. More surprising, is that at least part of the effect of large donations is to elicit a competitive response by males in the presence of attractive female fundraisers. In biological terms, male donors appear to engage in “competitive helping”. In a paper out today, we report the findings of a study of competitive helping based on fundraising pages from the 2014 London Marathon. We looked at the responses to large donations and compared how the responses varied by donor gender and fundraiser gender/attractiveness (do male donors increase their giving more in response to a large donation when there is an attractive female fundraiser?) and the gender of the person making the large donation (do male donors increase their giving more when the person making a large donation was another male?). Attractiveness was scored on the basis of external assessments of the fundraisers profile photos and attractive was defined as the top 25% of scores. The results are striking. We confirm that large donations elicit a positive response among subsequent donors in terms of how much they give. But the increase in giving triggered by a large donation is FOUR TIMES GREATER among male donors responding to a large donation given by another male donor in the presence of an attractive female fundraiser. It is hard to think of another explanation for this, other than a biological mechanism – male donors compete, albeit possibly subconsciously, with other male donors for the attention of attractive females. By contrast, there is no such response among female donors. What are the implications for fundraisers? Getting generous friends to donate early will help to raise more money. It is also important to choose a good profile picture – and one in which you are smiling. Not everyone can be among the most attractive fundraisers, but our results also show that a picture in which the fundraiser is smiling can be just as effective, boosting donations by more than 10%. Does money matter for schools? Money matters for the provision of most things. And in one sense, obviously it does – people’s jobs are at risk with budget cuts, promotions are postponed and tight budgets just make life a lot harder for Headteachers and Governors. And yet whether money matters for pupil attainment is much less clear. In fact, while there is evidence on both sides, possibly the majority of researchers in this field would agree that increases in a school’s resources are unlikely to have a major effect on attainment. This is in large part the debate about the number of teachers a school has relative to its pupils (class size) but it is also broader than that. It’s not that we haven’t seen big increases in spending. Over the last ten years of the Labour government, 2000 – 2010, real per pupil spending rose by 68%. While GCSE scores have risen over that period, we have not seen anything like a commensurate rise in attainment. (Quite why money doesn’t appear to help much is a really interesting question, but not one for today). More broadly, one of the findings from the international comparison of attainment in PISA is that money does not buy success; one of the ‘seven big [education] myths’ set out by PISA is “it’s all about money”. Nevertheless, the parties’ proposals for the education budget over the next parliament are interesting. Both Conservatives and Labour have made slightly differing pledges on ‘protecting’ the school budget. These have been decoded and quantified by Sam Freedman, one-man fact and analysis centre, now Research Director of TeachFirst. Labour promises a real terms protection of the entire 3-19 budget, but not a per-pupil protection, while the Conservatives promise a cash per-pupil protection of the schools budget. His best estimates are that under a Conservative government the implied cut for schools is about 10.5% and under a Labour administration a cut of about 9% because of steeply rising pupil numbers. On top of inflation and rising pupil numbers, schools face higher costs from higher pension and national insurance payments, so budgets are definitely going to be squeezed. What would be the likely consequences of any substantial budget cuts for schools? How would schools respond? The scientifically correct answer is “who knows”. Our analysis of schools’ financial decisions in the happier times of budget increases showed that there was zero consensus of action among schools on how to spend it. This graph shows the distribution of schools’ spending by category depending on how much their income rose or fell between 2008/9 and 2009/10. 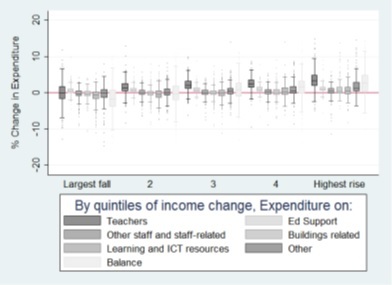 The box plot shows that for each group of schools and in each expenditure category some schools made big increases and some made big cuts. For any group of organisations there will be differences in emphasis, but this shows wildly different decisions being made in similar circumstances. Fewer than half of schools made an increase in spending on teachers their largest change. Of course, down is not the same as up, and some cuts could be severe; but it is very difficult to predict how schools will react to budget cuts, and even harder to predict the impact on pupil attainment. The big innovation in schools’ budgets over this parliament has been the Pupil Premium (PP) championed by the Liberal Democrats. It is paid to the school for each disadvantaged pupil in the school. While it is definitely an innovation, it is also important to recognise that the per-pupil funding for schools with many disadvantaged children was substantially higher than other schools under the previous government; see this for example. The PP started at £430 per pupil, increasing to £1300 for primary school pupils and £935 for secondary school pupils in 2014/15. The PP has been set up very well, in all but possibly one aspect. It is directly attached to an individual pupil which does make it different to what came before. Schools can plan financially on the basis of their current stock of PP-eligible pupils, and the admission of new intakes has clear financial implications. The funding was guaranteed for a number of years and was easily predictable. Also, the fact that the rate per child started relatively low and then increased substantially was a smart move as schools were not faced with an immediate supply of resource that they did not know how to spend. The negative aspect is the restrictions placed on how schools could spend the money. It’s clear why the restriction was made that the funds have to be spent solely on the eligible pupils and not just absorbed into the general school budget. But it rules out possibly the most important thing that a school could use the money for – to pay a bit more to hire a more effective maths or English teacher. One priority is to find a way to maintain the monitoring of the PP spend whilst opening up these possibilities. Will the PP be continued into the next Parliament? Both Labour and Conservatives have pledged to ‘protect’ the school budget, and while that obviously does not imply a line-by-line protection, it would seem hard to square these pledges with the scrapping of the PP. While money as a whole does not seem to matter as much in this context as others, losing a substantial additional sum focussed specifically on disadvantaged pupils would feel like a step backwards.